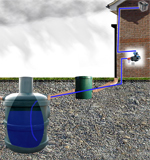 All our rainwater harvesting systems are manufactured in the UK by Ecosure. We have rainwater harvesting system for all uses including home and garden use also system for commercial and industrial units. All Ecosure's rainwater harvesting systems meet the British Standard BS8515:2009 and come with a 10 year guarantee. We are consuming even more water year after year and this will only grow, just 40 years ago we used 70% more water than today than. As a result of this we are being charged more for using a resource that falls from the sky for free. Reduce the possibility of a drought, which will lead to a hosepipe ban. Reduce the damage which is done to wildlife in wetlands, reservoir and rivers. We stock and manufacturer a large selection of water tanks and water butts, which are made for above and below ground, which range from 250 litres - 7000 Litres. We supply an extensive range of water pumps and irrigation systems for both home and the garden. 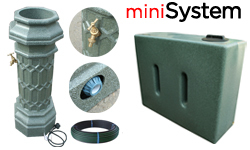 Also see our range of Industrial rain water tanks. We advise that you do not organise any builders, plumbers or other service to come and install your tank until the water tank has arrived. 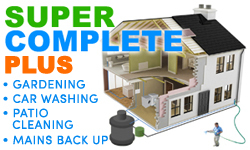 Ecosure products are made in the UK and most orders can be delivered within 3 - 5 days*. The shipping costs vary with each system as the tank size affects the delivery. Please call 0871 200 2082 for more details.